We’ve had a great start to to back to school shopping with some awesome deals, and some fantastic giveaways. We still have lots in store for our readers. This Children’s Place $75 Gift Card giveaway is just the start of some more awesome stuff. If your kids aren’t back in school yet chances are they will be soon. As parents we often times plan ahead to purchase everything for a new school year but then scramble last minute because we forgot something. It’s human nature to forget things but the worst thing to forget would be an awesome new Minecraft shirt or new pair of jeans to get a new school year started. So if you are doing some last-minute Back to School shopping then I suggest you head to The Children’s Place! The Children’s Place is a retailer that has great clothes at a great price. They almost always have a sale going on that you can stack with coupons and even earn rewards that you can use on future purchases. One of the biggest reasons I shop there is because of the savings. Let’s face it, kids grow fast and they are pretty rough on their clothes so spending a fortune on them is not on my agenda! When you head shopping at The Children’s Place make sure you sign-up for their free My Place Rewards program. It’s a rewards card that allows you to earn points on your purchases. Those points then turn into coupons that will help you save (and pay) on a future purchase. It’s basically free money just for shopping for your children’s clothes. Plus if you prefer to shop online, you will be happy to know that August is Free Shipping Month! No minimum purchase amount required! You know what would make your child’s school year even better? A FREE Shopping Spree! 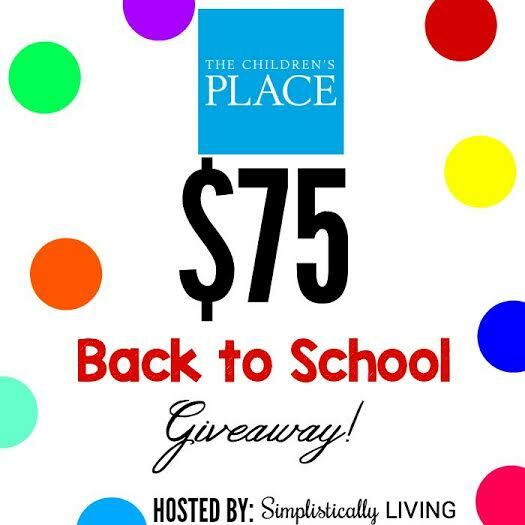 The Children’s Place is giving away a $75 Gift Card to one lucky winner to use to shop in one of their stores! All you have to do is enter using the rafflecopter widget below. Giveaway ends 8/28/15. Good Luck Everyone! My child’s favorite thing about school is getting to see all her friends again.